In this experiment, we will use triggering to make our wave form plots easier to understand. 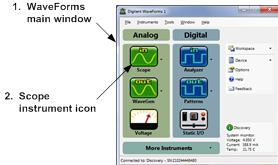 The Arbitrary Waveform Generator instrument on the Analog Discovery™ will be used to apply relatively rapidly varying wave forms to the oscilloscope. We will see that the high rate of change of these waveforms makes it difficult to interpret the waveform using our previous display techniques. We will then use triggering of the waveform to make the wave form easier to view and analyze. 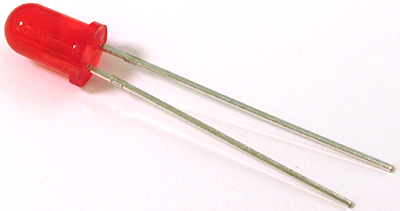 to measure and display time-varying voltages. Be able to identify the “level” and “slope condition” of a trigger point on a sketch of a waveform. 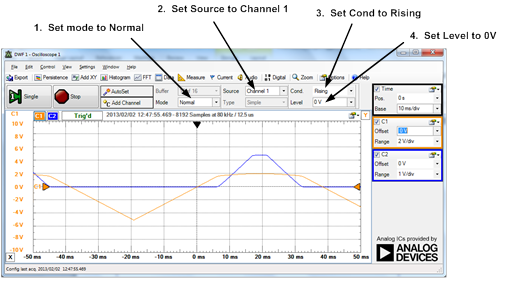 Use the Analog Discovery oscilloscope to perform triggered data acquisition. 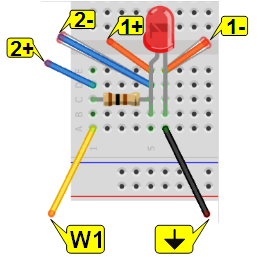 Connect the terminals of Channel 2 (2+, 2-) to the resistor terminals. 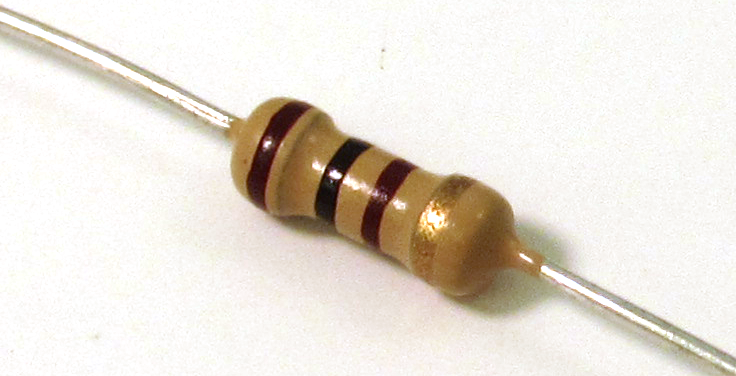 The image to the right displays the circuit setup required for the completion of this project. Click on to start acquiring data. (Make sure Waveform Generator is running as well.) The waveform should scroll past the screen. The time scale, however, makes it difficult to see details of the waveform. Change the time base to 20 ms/div so that we can get a closer look at the features on the time waveform. At time bases below about 100ms/div, the display no longer shows the waveform propagating across the screen. Instead, it displays successive “snapshots” of the waveform. So now, although the time scale would allow us to see details of the waveform, the images presented are jumpy and don't really allow us to focus on the data. Now change the time base to 10 ms/div. The signal becomes more spread out in time so that the features would be easier to measure, but the display updates so quickly that it's nearly impossible to read anything of use! 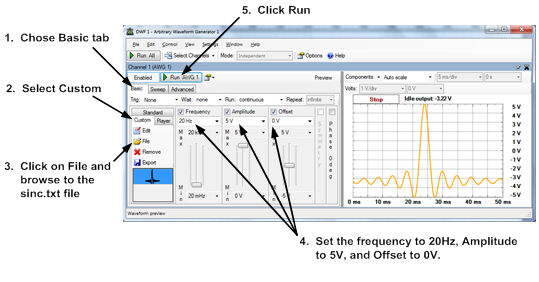 The waveform should “freeze” as shown in the figure above. Now, each “frame” of data shown by the scope will line up at the same point on the signal, so the display appears to be unchanging. This point, set to time = 0 seconds, is controlled by the trigger. The trigger we've chosen has caused time = 0 to be associated with the voltage on Channel 1. The trigger point is 0V. When the signal is rising the voltage is increasing. Change the Level to -2V and notice where the trigger point is relative to your new level. Change the Condition to “Falling” and note where the trigger point is relative to the new condition. Change where time = 0 is on the screen by clicking and dragging on the symbol at the top of the display window. Notice its effect on the displayed waveform. Download the sinc.txt file by right-clicking the link and selecting “Save Link As..” to save it to your computer. 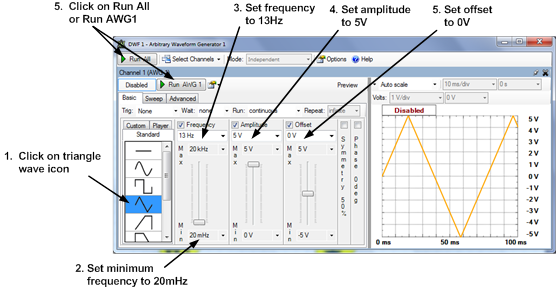 Use Channel 1 of your function generator to import the file into the Waveform Generator and set the amplitude and frequencies as shown below. Connect Channel 1 of your oscilloscope (1+ and 1- terminals) directly to the AWG1 (W1 and Ground terminals).Set up your oscilloscope to trigger on the rising edge of the signal at a voltage of 0V. Use a time base of 5ms/div and a vertical scale of 2V/div on your oscilloscope display. Run the scope to see the signal.